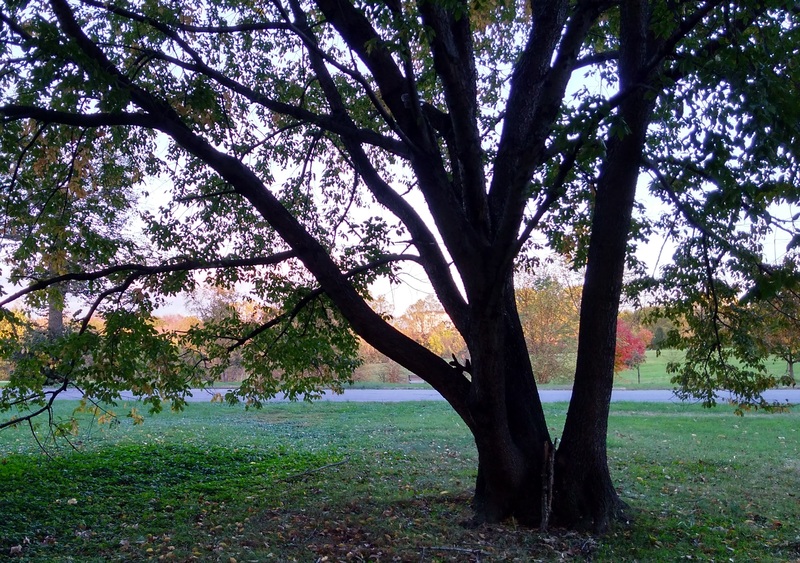 The first tree that beckoned me, long ago, was a sapling on the far side of my grandmother’s lawn. Sensing that it was silently calling me, I went to investigate and discovered that it was being strangled by an orange plastic band encircling its trunk. 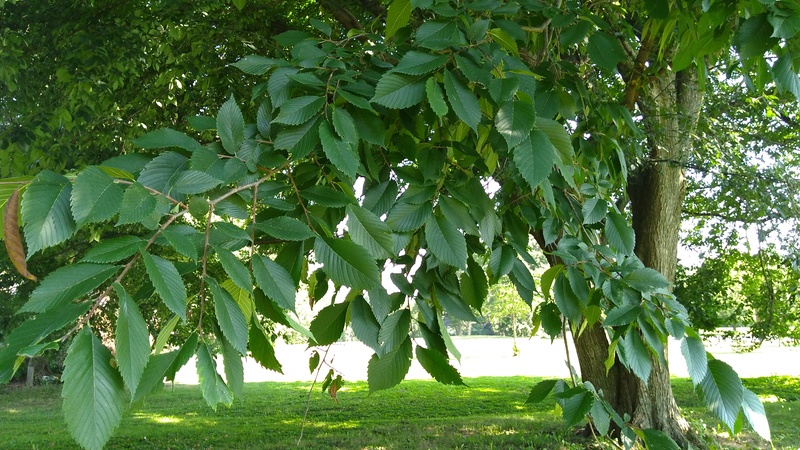 The sapling had probably been purchased at a local nursery, with a label and price tag attached to the band. My grandmother had neglected to remove it. The trunk of the tree, now grown, was being choked by the now tight plastic ring. When I cut it off, I may have merely imagined the tree’s relief. I felt certain, however, that the tree had been sending out a signal of distress, which I had somehow sensed. About a year ago, another tree called to me. It was much older and the call was different kind of call. I was nearly home from my morning walk. One block ahead of me, on the edge of the local park, a large, beautiful tree I had never noticed before drew me toward it. During my walk I’d been praying about a conversation that was scheduled soon. With others, I was planning a new program and had been encouraged to let myself “think outside the box.” I wanted to be faithful and really hear what God’s plan might be. The tree invited me to come near. I left the heat of that late August morning and entered into its welcoming shade. The trunk split into many tall, gracefully curved branches, their shiny green leaves high over my head and all around me. I leaned back against the trunk and imagined roots deep in the ground. I resumed my prayer for guidance and divine inspiration. As I rested against the tree, a new idea came, something “outside the box,” along with a surge of energy and excitement. I brought this new possibility into the conversation I had soon after, and it grew into something wonderful. It felt like a gift–not from the tree, exactly, but received because I had connected with the tree that way. In the months that followed, I felt invited to become well acquainted with the tree, its graceful spreading canopy, its dark oval leaves edged with tiny serrations, the bark grey-brown and ridged. Friends more knowledgeable than I have identified it as an American Elm. I noticed that the roots had thrown up a couple of old paving stones; it had outgrown once tidy borders. 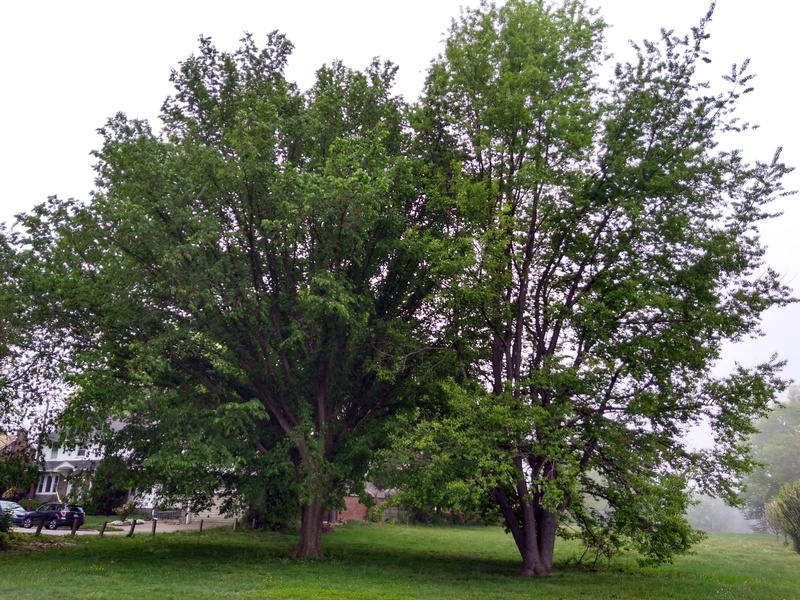 It had likely been planted nearly a hundred years ago, at the edge of a park established on what had been a Quaker farm, not far from where William Penn landed in 1682, in what had then been a mostly Swedish settlement. The land on which the tree was growing, near Ridley Creek, had long been inhabited by the Ockehocking Tribe. Again and again, at many different times of day, and during different seasons, I’ve returned to that beautiful tree; it lives less than two blocks from me. Gradually I realized that unconsciously I have been thinking of myself as somehow bigger, more important than the tree. It has taken a while to notice my human prejudices. The issue of size is indisputable. Physically, the tree is immensely larger than I. 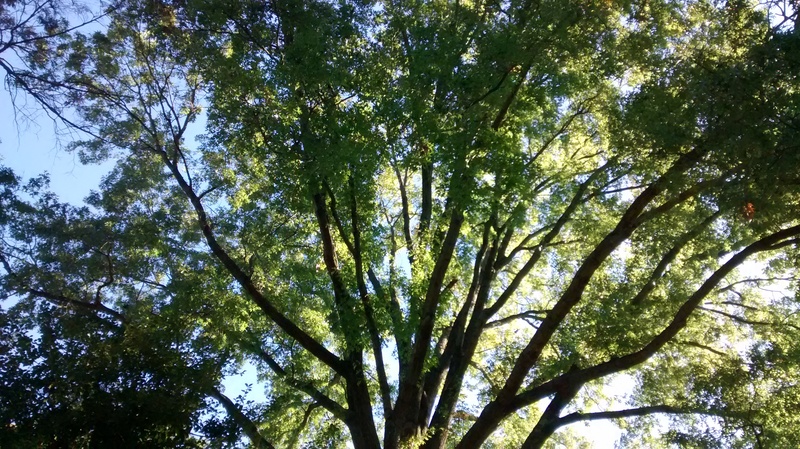 When I lean against the trunk and look up into its branches, they rise perhaps sixty or seventy feet over my head, with a span more than half that wide. Slowly, I have recognized my prejudice that I, a human being, am worth more than a tree. I now question this view. I discovered another blind spot when I invited my husband to come meet “my” tree. My beautiful Elm stands beside another tree that is taller. The neighbor is farther into the park and gets more sun. “It has a friend!” my husband exclaimed, when he saw the two trees side by side. Suddenly I recognized that I had been viewing the other tree as a rival for the sun. His comment enabled me to see that, in fact, the two are companions. They help shelter each other from the wind, and, no doubt, their roots are intertwined. 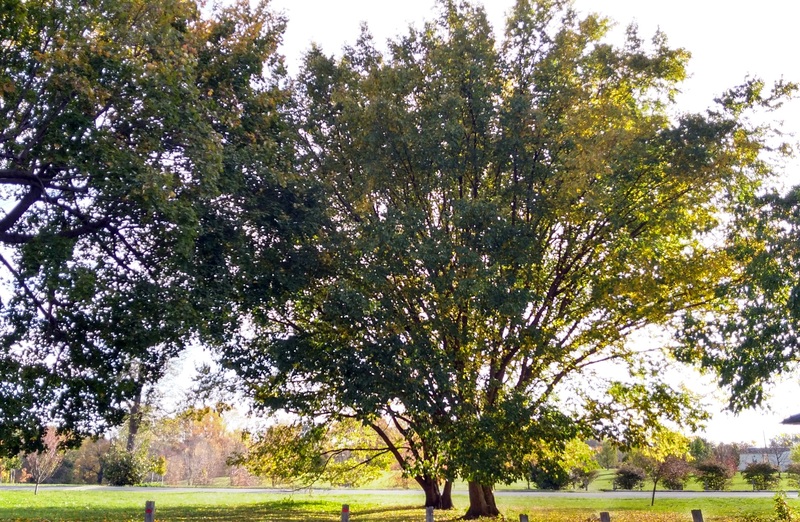 Soon after, I looked around and realized that the pair are part of a whole community of trees, a community that knows no borders and includes not only trees in the park but also the ones on the nearby streets, including a towering Sycamore a block away. I know I have a lot more to learn from these living trees. They are more than beautiful. They purify the air and provide oxygen that my neighbors and I breathe. Surely they also give many more gifts. I wonder, will I also discover that this large, beautiful tree not only invited me to learn from it, but also, like the little sapling on my grandmother’s lawn, called to me because it is in distress? This community of trees is no doubt disturbed–and in the long term endangered–by urban sprawl, toxins, and climate change. I look forward to what else I will learn from being in relationship with living trees. September 8, 2018 is a global Day of Action demanding real climate leadership. Rise for Climate is planning thousands of rallies in cities and towns around the world to demand that local leaders everywhere put life, people and justice ahead of profits for the fossil fuel industry. Click HERE to find a Rise for Climate, Jobs and Justice rally near you. Reversing climate change is the biggest right-to-life issue on the planet. This entry was posted in All of Life is Sacred, Stories that Heal and tagged communication with trees, community of trees, human prejudices, living trees. Bookmark the permalink. I know those trees, I have photographed fireworks through them! They are beautiful to photograph, aren’t they? Beautifully written and mind expanding; mine.
. Of course, my last name is Wood so I may have an affinity with trees. I don’t know these particular trees, but your reflections reminded me of the beautiful, tall, solid, and graceful elms of my childhood. Sheboygan, Wisconsin, where I grew up, was once known as Elm City because of the many American Elms that spread a canopy over city streets. Alas, Dutch Elm Disease caused the demise of many of these wonderful citizens. It is a blessing to know that a cure for this scourge has saved many elms in this part of the world. Thank you, Marcelle. Thank you for sharing the story of Elm City, John! Thank you for this writing — I love the title. Loved the writing and the photos here. Thank you. Thank you, Marcelle, for your wonderful message! Trees are always beckoning. All one has to do is listen. 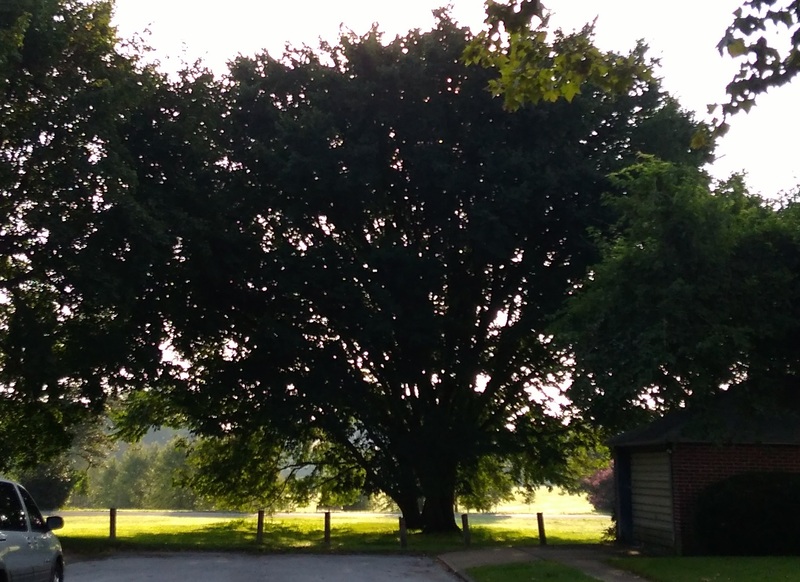 This is why Newtown Square Friends Meeting holds its Twilight Meetings for Worship in natural areas, surrounded by trees. You are right, John, that trees are always beckoning; the challenge it to learn how to listen and to take the time to do so. I’m still learning to do that. But, like you, I love trees a whole lot. Thanks for holding the Twilight Meetings for Worship. Recently, when asked what my sustaining spiritual practices are, I rattled off the usual “official” practices but then spontaneously added “Tall trees. It’s important to me to spend time each day among tall trees.” Thank you for sharing your deep, expansive, humble relationship with trees. Thank you, Kate. Now that you mention it, I think that spending time among tall trees is a spiritual practice for me, too. They communicate–and share–something powerful with their presence and long-term rooted stability. Thank you, Marcelle. I do so resonate with your thoughts about trees. 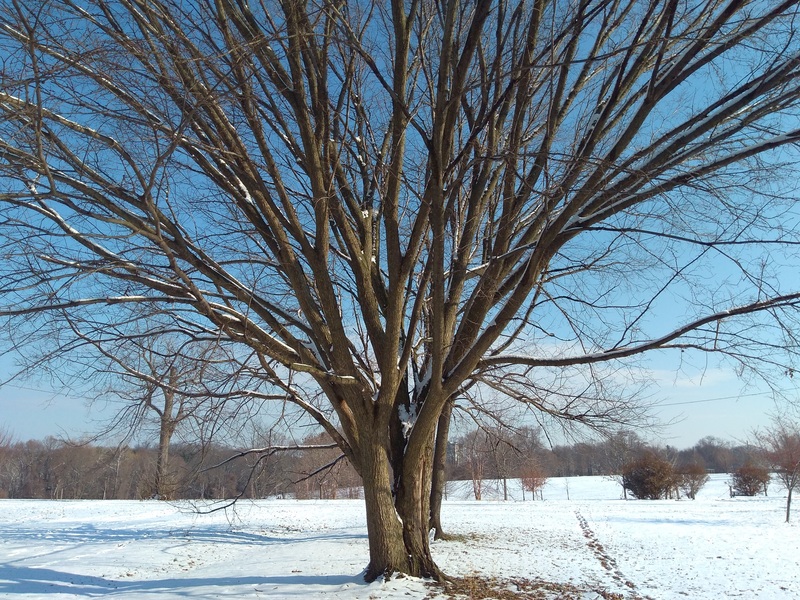 They have been important to me since childhood, beginning with the large, maple tree in our front yard on the farm. It held my swing, shaded the yard where I often played and where our family often rested on hot days; it felt like a friend. Love emanated from that tree. Today a buckeye tree and a red bud tree outside my kitchen window that are special to me. Dear Lois, Thank you for sharing the maple tree from your childhood and the love that emanated from it, as well as the trees that are your special friends today! Beginning to listen to trees myself. Thanks for sharing and keep listening! Blessings, Kim, on your friendship with trees. I’d love to hear what they communicate with you.